I’m doing a presentation on how Jesus is represented in south park and will be using these videos. Not sure exactly what I will say but I’ve got 4 hours to figure it out. 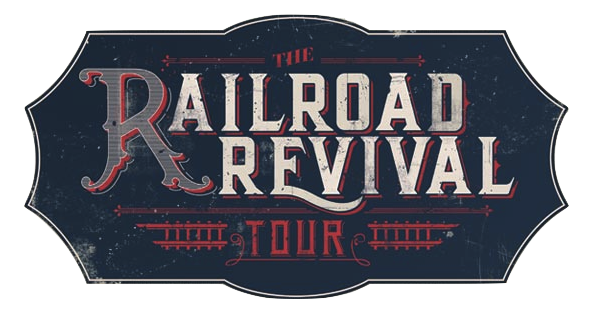 Last night I went to go see the Railroad Revival Tour in San Pedro headlined by Mumford and Sons. You can read all about the tour here if you want to but it’s basically three bands taking a train from show to show and spreading the joy of new(ish) folk music. Given the recent popularity of Mumford and Sons I was expecting a college age crowd decked out in their finest Urban Outfitter attire and I wasn’t disappointed. What I wasn’t expecting was everyone throwing away their attempted hipster cool and breaking out into good ol fashioned foot stomping during the heavy bluegrass music of Old Crow Medicine Show. I was kind of taken aback by a 20 year old in a fedora and scarf finally putting to use the square dance lessons he had to take in 5th grade, it was actually quite refreshing to see. Mumford and Sons were much better live than I was expecting. I knew it would be hard pulling off a big sound without electric instruments or a drum set but they did it really well. What was cool is that they used their voices as the main source of power for their music. They way the sang their melodies and let them soar over the instruments was really inspiring and allowed their passion to shine through. Because I’m a theology geek I couldn’t help but notice all the religious overtones to the evening. The first person on the stage for the night welcomed us to the show and wished us a happy Good Friday, which I thought was awesome and kind of weird at the same time. Maybe my favorite moment of the entire show was when M&S played a new song called “Lover of the Light” and a woman next to me asked her boyfriend “Is this some kind of Christian thing?” and he quickly responded with “Please don’t ruin this for me!” Even if you didn’t want to acknowledge the Christian themes echoing through the music it was still a cool experience to hear them sing “Roll Away Your Stone” and “Awake My Soul” on Good Friday. I’m not sure if everyone had the same sense that I did as we participated in these songs but I truly felt it was a celebration of the darkness and uncertainty of faith. 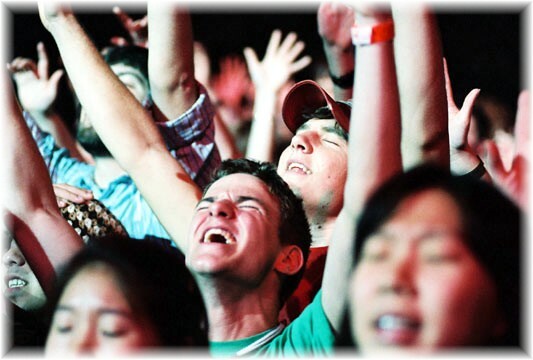 People were able to sing and dance in the face of all that frustrates and discourages us. There is a sense of calling to their music that boarders on hopeful yet realistic to the conditions we live in. Last night was a chance to release some of the constant tension and reach out for something to help us get through another day… whatever that may be for you. Here’s “Awake My Soul” for you to listen to, hopefully it means something to you as well. This week in our theology and culture class we tried to tackle the state of the arts. After a bit on street art (go check out the exhibit at the downtown MOCA if you’re interested) the class wanted to dig into pop music and it inevitably became a conversation about how bad Christian pop music is. I find it really funny that whenever we introduce the subject of pop music the first questions from the class are usually about contemporary worship music and how to “redeem” pop music. I agree that most of contemporary Christian music leaves something to be desired but I don’t feel like we then need to reclaim or “redeem” so called secular music. Most pop songs are asking the same questions and seeking the same things that people of faith are… they just might not come down on the same answer. Barry brought up that pop music often carries themes of alienation, isolation, dislocation and the need for connection… sounds a lot like Psalms and Ecclesiastes. Pop music speaks to the brokenness of the human condition and doesn’t try to give you a theological paradigm to explain it or make you feel better about it. Where we are sometime hesitant to question or express anger towards God in a faith setting, pop music most often allows for a space for honest expression. On a side note, it’s always fun showing people how the whole contemporary christian worship experience comes the hippie culture and the split offs of psychedelic music. Psychedelic music split into psychedelic rock, progressive rock and country rock. Contemporary christian music come directly from the country rock movement of the 70s and the ecstatic nature of the hippies trying to reach the transcendent (often through the use of drugs). 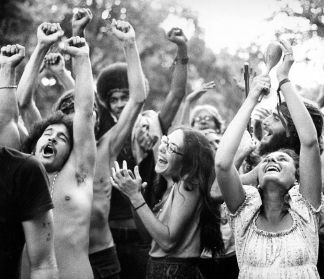 Anyhow, just check out these two photos; one is of people at a worship concert, the other is a group of hippies dancing… can you tell the difference? A lot of the people in class are either currently working in or have extensive experience working in church ministry and so these conversations often lead to questions on how the issues discussed can be used in a practical way. So the issue today was if the medium is the message than what do we do with the gospel? 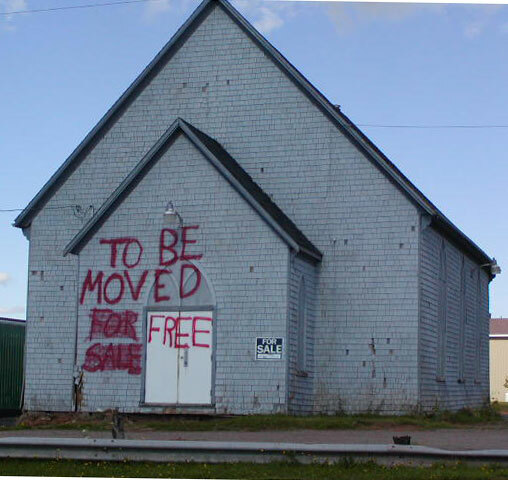 There is a palpable fear among church leaders of “compromising” the gospel in order to market it or make it more accessible to non church-goers. My friend Peggy would always warn of throwing the baby out with the bathwater when trying to recontextualize the message of Jesus. What I think we came away with is that we are not to negate the content or dismiss it but we must understand the medium (or container) that the message is being conveyed through or the message becomes compromised or rendered pointless. Jon Harris has come up with a couple very interesting forms to storytelling and I believe that are a great example of the medium being more important than the content they carry. He has built a couple tools in order to share the stories of individuals as well as gather the global stories that are occurring. What I really appreciate about his work is the challenge to embrace a modern mythology that demands our exploration. Even though the Christian narrative is part of our story we are also shaped and defined by other (maybe more collective) narratives including language, race, age, gender, sexuality, wealth, education, etc. The task that I am trying to wrap my head around is how to live in the intersections of all the story lines of my life. Any spiritual practice or idea that I feel is worth hanging on to needs to be put through these different intersections. Hopefully they will both shape each other and I can make a little more sense of the world I’m living in. To be honest this study doesn’t really surprise me but I think using the word extinct is a little harsh. There are tons of culture practices that have come and gone through the ages without being deemed extinct (disco anyone?) What this study says to me is that religion is no longer going to be a widespread cultural practice in these areas but that people may (or may not) still have a faith in a divine presence. I am interested how many people responded as atheist, that would be a more telling stat about the potential extinction of religion. The future of the church in our country is cloudy at best and trending towards a similar fate. I believe that the church still has some cultural relevance to people and so will continue to function though it has lost a tremendous amount of authority and no longer has a viable voice in the larger conversations. I’m not here to trash the church, I think the church still does a tremendous amount of good, but there needs to be a great deal of re-evaluation. I love cheesy horror movies. In honor of St. Patrick’s day the Syfy channel is having a marathon of the Leprechaun movies, easily my favorites of the bad horror genre. As I’m sitting here watching Leprechaun 3 (which takes place in Vegas, awesome!) 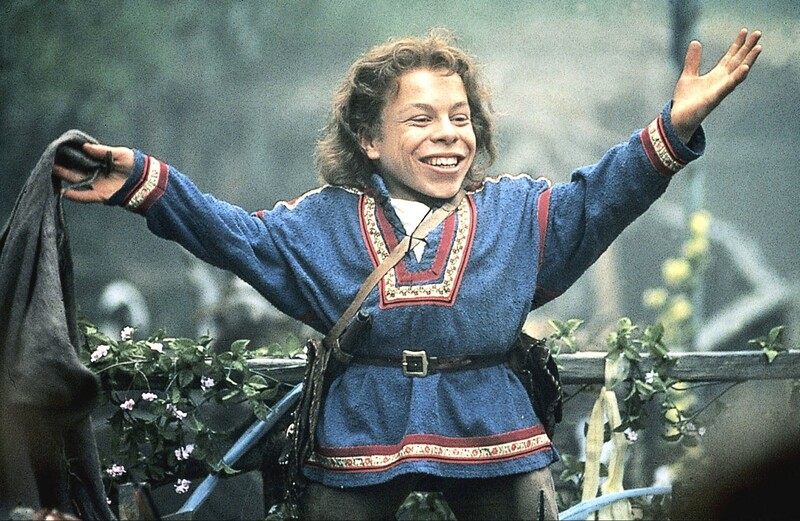 I decided to look up the actor who plays the Leprechaun, Warwick Davis, on imdb. This guy has been in everything! Not only is he my favorite horror character, he was also Willow and Wicket the Ewok! He’s been in all the Harry Potter movies, the new versions of the Chronicles of Narnia and Star Wars: Episode 1. I will celebrate his amazing career by continuing to watch the Leprechaun marathon while singing the Ewok song. I think that one of the main reasons for this viewpoint is that the church is no longer a place of authority or perceived as the guardian of truth and so people have a hard time accepting statements of certainty. Faith itself is an uncertain practice and so anything that claims definitive answers is seen has misguided if not disregarded. Where I think creeds are helpful, and Pete gets at this a bit, are as conversation starters and historical markers of faith through the ages. It’s unrealistic to expect a person of faith to ascribe to something written and adopted in the forth century without questioning it and testing it against one’s own experience and contemporary theological thought. Unfortunately the church has fallen so far from the public consciousness that anything seen as traditional or dogmatic has been stained in the eyes of emerging believers. The statement “I’m spiritual but not religious” speaks to this mindset… people are interested in exploring the divine but are unsatisfied with the tools and institutions that claim that purpose. I appreciate creeds and their thoughtful search for the divine and I believe that their use in our context is to further the conversation of how faith is being expressed as we pursue the unknowable.